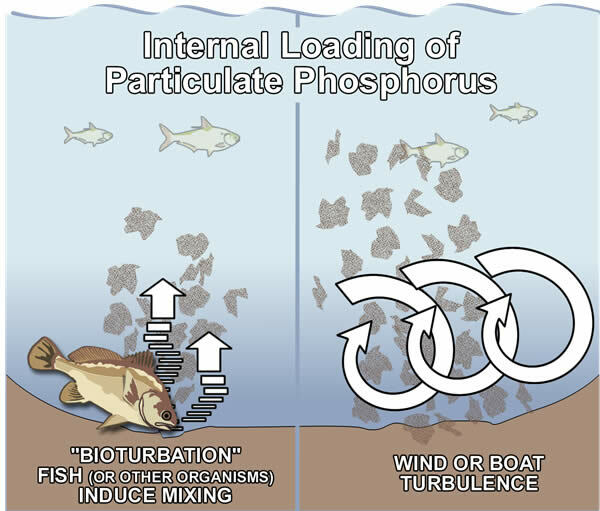 Internal loading of particulate phosphorus can result from mixing, typically by wind or boat traffic. As the water is churned, phosphorus-rich sediments are agitated and introduced to the water above, making it turbid and muddy looking. Certain fish and invertebrates that live or feed in the sediments can agitate the bottom as well. Carp are a common culprit. As they go about their lives the only way they know how, they stir up the lake’s sediments. This process is called bioturbation, simply meaning that the turbidity is biological in origin. Another particulate form of phosphorus is algae itself. Some species of algae actually have a resting stage in which they hang out at the bottom of the lake. During that time, they may pull phosphorus out of the sediments and incorporate it into their cells. When environmental conditions are just right, they float to the surface, carrying all of that phosphorus with them.